Bristol-Myers Squibb announced that the CheckMate -141 trial evaluating Opdivo (nivolumab) vs. investigator’s choice in patients with recurrent or metastatic platinum-refractory squamous cell carcinoma of the head and neck (SCCHN) was stopped early due to the study meeting its primary endpoint. CheckMate -141 was an open-label, randomized Phase 3 study evaluating Opdivo (3mg/kg) vs. investigator’s choice of therapy (cetuximab, methotrexate, or docetaxel) in 361 previously-treated patients with primary, recurrent, or metastatic SCCHN who have tumor progression on or within 6 months of platinum therapy. The primary endpoint was overall survival (OS), with objective response rate and progression free survival as secondary endpoints. Study investigators were informed of the decision to stop the trial early when an assessment conducted by the independent Data Monitoring Committee (DMC) concluded that patients who received Opdivo demonstrated superior OS compared to the control arm. Bristol-Myers Squibb is working to ensure that eligible patients have the opportunity to continue or start their treatment with Opdivo. The company will complete a full assessment of the CheckMate -141 data for future presentations and publications. 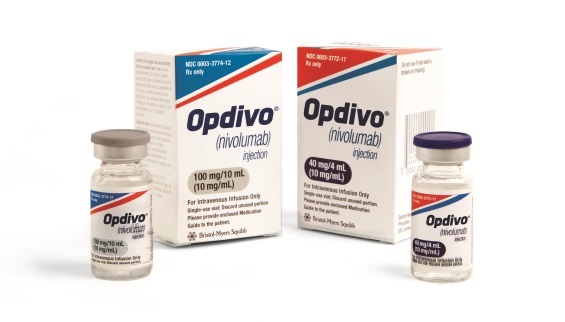 Opdivo is a PD-1 immune checkpoint inhibitor currently indicated for the treatment of BRAF V600 wild-type or BRAF V600 mutation-positive unresectable or metastatic melanoma, advanced renal cell carcinoma (RCC), and metastatic non-small cell lung cancer (NSCLC) with progression on or after platinum-based chemotherapy.